The industry’s first intelligent EHR workstation enhances both IT and clinical efficacy. Envoy is so valuable because it fully syncs with Rhythm, which provides real-time data on the hospital’s capital assets so that they can make informed decisions on technology investments. That way, hospitals can operate more competitively in their markets. Electronic health record (EHR) workstations have come a long way. Initially just a computer on a cart, today’s EHR workstations are sophisticated clinical tools. 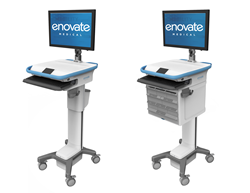 Enovate Medical’s new Envoy workstation takes this evolution to the next level. It is the first intelligent workstation designed to reduce nursing fatigue, enhance patient engagement, endure the rigors of hospital settings, and perform without interruption throughout a clinician’s shift. Increases Connectedness – Envoy saves time with Enovate’s exclusive FollowMe™ personalization and one-touch controls, allowing nurses to focus on patient care. Enovate’ s mobile device management software, Rhythm™, gives the IT staff remote visibility on the real-time status and location of every Envoy in the hospital. Reduces Nursing Fatigue – The Envoy’s lightweight design helps to lighten the nurse’s load. AutoTrax™ casters and the re-engineered EcoFlex™ power system provide a balanced overall design that allows nurses to navigate the hospital with ease. Enhances Patient Engagement – Envoy’s Sightline™ arm lowers to ensure the monitor never interferes with personalized care and adjusts for comfortable viewing in a seated position. The monitor even folds flat for maximum safety when traveling in busy hallways. Endures the Hospital Environment – The Enovate engineers used extensive Finite Element Analysis (FEA) and durability testing to deliver an Envoy built to last. From hospital-grade disinfectants to the wear and tear of near-constant use, the Envoy will withstand the rigors characteristic of any hospital setting. Extends Battery Life – Envoy’s EcoFlex™ power management technology extends battery life up to 30 percent which reduces replacement costs. Longer lasting batteries allow nurses to work with greater continuity and fewer interruptions, reducing the risk of errors. Enovate’s Envoy Mobile EHR Workstation will debut at the HIMSS 2018 Annual Conference & Exhibition, Booth 3021, March 5 – 9, 2018 in Las Vegas, NV. Enovate Medical designs and manufactures fixed and mobile workstations, mobile computing power systems, and integrated workstation management software. Enovate’s advanced technology helps enhance nursing productivity, improve patient care, simplify IT management, lower maintenance costs, and deliver the highest standard of quality available for today’s electronic medical record systems. For more information about Enovate, please visit http://www.enovatemedical.com or contact Dawn Wilson at 888-909-8906 ext. 121.